Surgery is the only method to alleviate disability in several common conditions. However, unsafe surgery can lead to morbidity and mortality. In industrialised countries, nearly half of all adverse events in hospitalised patients are related to surgery and at least half of them are considered preventable. In 2008, the World Health Organisation (WHO) created the implementation manual for the WHO surgical safety checklist. The checklist was intended to be universally applicable with adaptations to fit specific disciplines. It is administered at three critical junctures: before induction of anaesthesia, before skin incision, and before patient leaves the operating room. It was adapted for eye surgeries by The Royal College of Ophthalmologists, UK, in 2010 and the American Academy of Ophthalmology in 2012., In a survey conducted with the members of the Royal College of Ophthalmologists, 94% of respondents considered that a preoperative checklist added value to cataract surgery. However, the participants in the study also recommended inclusion of blood glucose level check from the list. Primary health care in the Western countries involves a structured health care with general practitioners and nurse practitioners. A majority of patients are well informed about control of comorbidities. Studies show that more than half of the diabetic patients have poor glycaemic control, uncontrolled hypertension, and dyslipidaemia; which are associated with high morbidity and mortality in the operation theatres. Their high prevalence of risk factors, such as hypertension, diabetes mellitus, renal insufficiency, chronic heart failure and chronic obstructive pulmonary disease, increases the incidence of perioperative myocardial ischaemia to as high as 31%. The mortality rate within 90 days of cataract surgery is 7.1/1000 patients. Rather than mortality; negligent surgery, biometry error or wrong intraocular lens implantation are the main reasons for claims in the NHS. These can be prevented with proper planning of surgery and a checklist, ensures it. The Indian population also reflects a prevalence of hypertension in 57.4% (32% known) and controlled diabetes only in 28.8%. However, the structure of Indian healthcare is unorganised. Hence, the ophthalmologist has to ensure that blood pressure and sugar levels are controlled by the physician before the surgery. Hence, a checklist in Western scenario has to be adapted to Indian healthcare. H V Desai Eye Hospital, providing comprehensive and high volume eye surgery in Pune, has created its own checklist, for eye surgeries keeping in mind local needs. 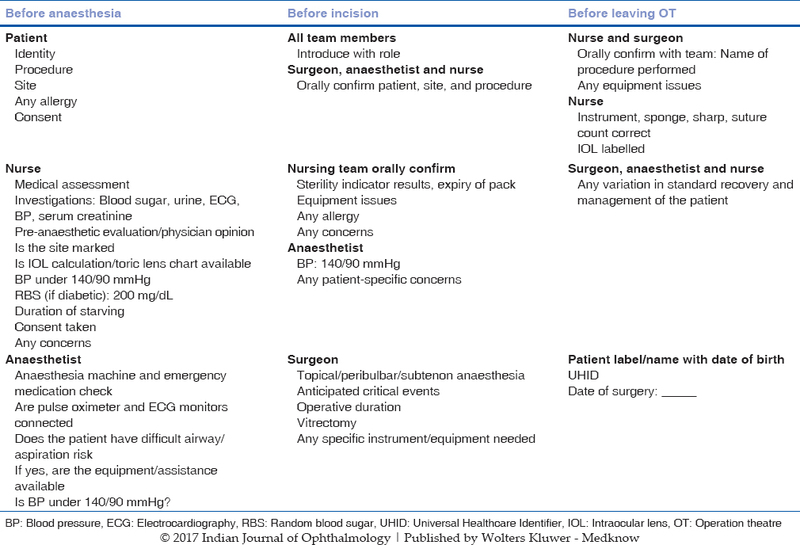 Our checklists different from those at tertiary care hospitals, is suited to ophthalmic day centres in reducing errors [Table 1]. It is more comprehensive. Our proposal is important as it is mandatory for hospitals to have at least entry level NABH accreditation to be eligible for reimbursement by insurance companies. The checklist not only prevents errors but also helps in avoiding violence against doctors. World Alliance for Patient Safety. WHO Guidelines for Safe Surgery. Geneva: World Health Organization; 2008. Kelly SP, Steeples LR, Smith R, Azuara-Blanco A. Surgical checklist for cataract surgery: Progress with the initiative by the Royal College of Ophthalmologists to improve patient safety. Eye (Lond) 2013;27:878-82. Available from: https://www.aao.org/patient-safety-statement/ophthalmic-surgical-task-force-surgery-checklist-2. [Last accessed on 2016 Nov 06]. Available from: https://www.aao.org/Assets/0985ab39-20ce-4779-9322-e718972edd86/635711977904770000/anesthesia- management-of-ophthalmic-surgery-in-geriatric-patients-pdf. [Last accessed on 2017 Mar 05]. Available from: http://www.safesurg.org/uploads/1/0/9/0/1090835/eyehospitalchecklist.pdf. [Last accessed on 2016 Nov 06].